I've had this beer in the fridge for ages and thought I should probably get onto it. I thought this was a Belgian beer, but apparently it's brewed in the Netherlands. I've always been a fan of beers with the ceramic (or plastic) tops, as it helps keep the beer fresher than your average screwcap. This beer is name after a type of hops, Nobel. This particular strain of the hop flower is known moreso for it's aromatic qualities than any bitterness that it may add to the beer. Euro Strong Lager's are one of the best keeping beers due to their high alcohol content. 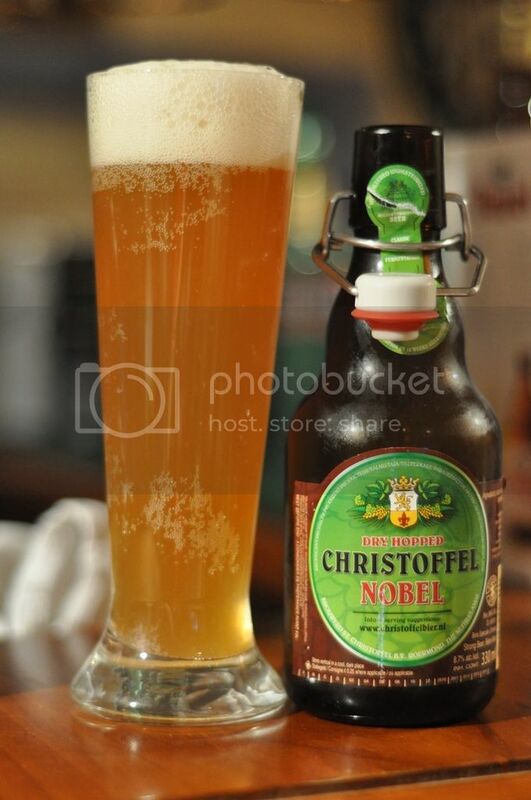 Christoffel Nobel pours a slightly cloudy gold colour with a tight looking 3 finger head. The head isn't brilliant white but it's not far off. There doesn't appear to be much carbonation rising to this head but it still looks like a good pilsner (even though it's not...). This beer is unfiltered so there is some sediment, don't let this put you off just make sure you invert it before pouring. The sediment is what causes this beer to appear different colours at the top and the bottom. Not a bad looking beer, not great though normally I would prefer a darker colour in a Euro Strong Lager. The beers smells strongly of the spicy floral hops that it's name promised. There are also some grassy hops that I didn't expect to smell, however they smell of a similarly high quality. The overall tone of the beer is slightly sweet. The malts smell grainy and a little like honey. Fruity element are also present but they fall into the background, behind the strong malt and hop flavours. Excellent smelling beer, hopefully the taste lives up to expectations. When tasting this beer it becomes apparent that Saaz hops are the other variety of hops in this beer. There is the typical Saaz bite that I would expect from a pilsner, before it is swamped by this sickly sweet honey flavoured malts. The noble hops taste fresh and spicy but still strangely sweet, and while there is some citrus present it's not enough to prevent the beer from being far too sweet. I'm not really a fan of this beer, but I do respect the ideals they were trying to acheive. I'm afraid to say I actually don't really like it. The beer seems slightly too sweet for my tastes and doesn't really have a good balance to it. The hops were excellent, but unfortunately this is the only element of the beer that was positive. The malts were overly sweet and the body is far too thick. It would be a horrible beer to have to drink many of, it would become really hard to drink. I would say it's worth a try, but there are much better examples of the style.